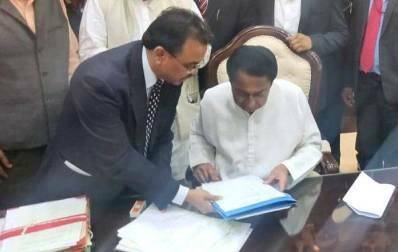 ONI Bureau: Within a couple of hours of taking oath as the Chief Minister of Madhya Pradesh, Kamal Nath signed the farm loan waiver file, clearing the way for farmers to get up to Rs 2 lakh waiver on their existing loans. Kamal Nath fulfilled Congress President Rahul Gandhi’s poll promise of waiving the farm loan within 10 days of coming to power. It was later included in party’s manifesto, ‘Vachan Patra’. After the Chief Minister signed the farm loan waiver file, Rajesh Rajora, Principal Secretary, Farmers’ Welfare and Agriculture Development Department, issued an order in this regard. The order says, “Madhya Pradesh Government has taken a decision to write off short-term crop loan of eligible farmers up to the limit of Rs two lakh, as on March 31, 2018, from nationalised and cooperative banks”.